The annual State of the System report for public broadcasting, derived directly from public radio and television station data in the donorCentrics Benchmarking Project, has been presented by Target Analytics, a division of Blackbaud, for more than 20 years. In FY17, 78 stations participated with a combined 3.5 million donors and representing a wide variety of station sizes, licensee types, formats and geographic locations. Trends through FY17 mark the first time in decades that both radio and television had significant increases in donors and revenue. Public television in particular has struggled with declining donor counts over the last 20 years in conjunction with changing donor habits and the added challenge of the proliferation of cable television, followed by video-on-demand services. 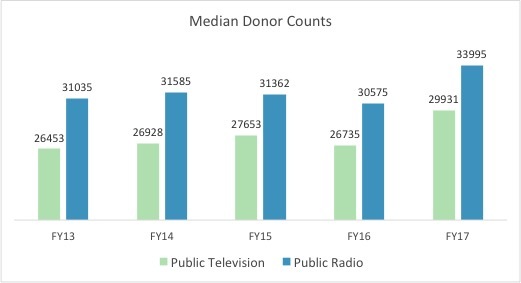 By FY13, median public television donor counts had declined by 40 percent from FY98 counts. Donors made a slight but welcomed recovery in FY14 and FY15, with increases of less than 3 percent driven by sustaining donor growth and retention, canvassing and high-profile programs such as Downton Abbey. But the game-changer was the FY16 launch of Passport, PBS’ answer to network television’s on-demand services and content providers such as Netflix and Hulu. The results have been startling. In FY17, median public television donor counts increased by 12 percent. Eighty-nine percent of stations in the donorCentrics Benchmarking project had an increase in donor counts; 33 percent experienced double-digit donor growth. Median new-donor counts increased by 24 percent in FY17, driving much of the overall donor growth. By far, the biggest change in acquisition in the last two years has been in digital acquisition and Passport. In FY15, digital acquisition (email and web gifts received outside of pledge periods) accounted for 6 percent of all new donors in the study. In FY16, Passport and digital combined were responsible for 17 percent of all new donors. (Note that not all stations are coding Passport as a distinct source.) In FY17, this figure leapt again to 33 percent — a full third of all new donors. As an added benefit for file health, 39 percent of the FY17 new donors were sustainers, up from 30 percent in FY16. By individual station, sustainers as a share of total donors ranged from 15 percent to 59 percent, the highest of any public television station to date in our study. New donors acquired as sustainers in FY16 had a median 13th-month retention rate of 57 percent in FY17. 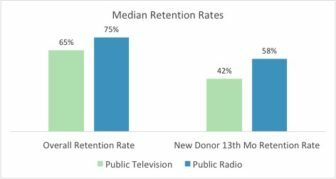 This is the highest median retention rate for new sustaining donors since FY14 — the first year in which many stations began acquiring new sustainers in significant numbers. Over time, improved credit-card recapturing and general program management evolved into better and best practices, increasing retention rates for these donors. The FY17 increase in retention rates can also be attributed to growth in the share of donors paying via direct debit. Donors who contribute via direct debit from their checking accounts had a median 13th-month retention rate of 79 percent versus 55 percent for those on credit card. The ability of door-to-door canvassers to acquire donors as direct-debit sustainers accounts for their median 13th-month retention rate of 71 percent — the highest of any other acquisition source for sustaining donors. Sustaining donors acquired by Passport were retained at 57 percent, just slightly better than pledge donors, who were retained at a median 54 percent 13th-month retention rate. While the impact of Passport on the size of public television donor files gives the system much to celebrate, an impact on donor value warrants some caution and careful observation. As noted above, median donor counts increased by 12 percent in FY17. Median revenue increased by 10 percent in the same year — a significant increase, but one that indicates a decline in donor value. Indeed, the median value of FY17 new donors declined by $15 per donor, from $107 to $92. That was driven by the increase in the share of sustaining donors — donors that did not have time to make all 12 gifts had lower revenue per donor within the fiscal year — but also the much lower ask of $5 per month required for Passport instead of the more typical $10- or $20-per-month ask used during pledge. 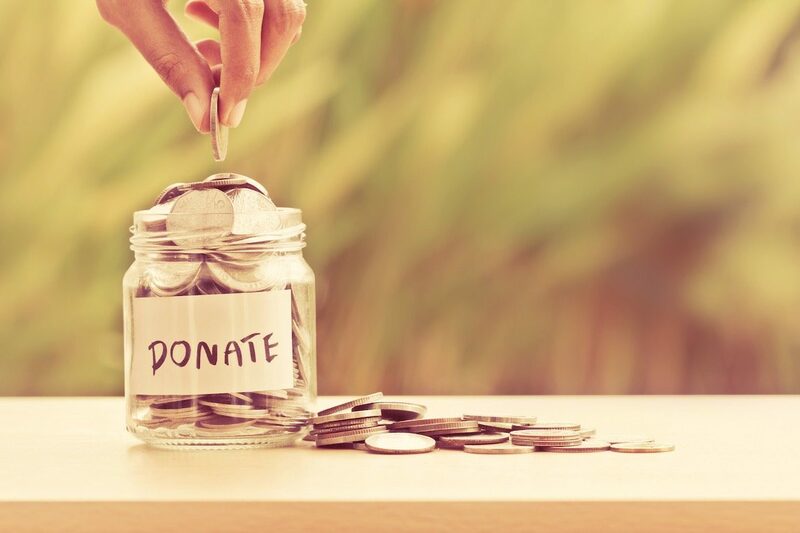 Traditionally, lowering donor value to increase donor volume can be a fine strategy, so long as overall revenue increases as well. In that way, the mission is served and many of the new lower-value donors will be upgraded over the years to come — again, traditionally. However, these new Passport donors are not entirely traditional. Passport donors are younger and may be more interested in the service than the mission. Also, while sustaining new donors will renew at rates better than single-gift or one-time gift donors, they do not upgrade at the same rates as single-gift donors. In FY17, multiyear (not new) single-gift donors upgraded at 36 percent. Only 14 percent of all multiyear sustainers increased their monthly average gifts, and less than 5 percent made an additional gift. Passport has been a boon to the system, one which has tremendous potential. Increasing the new Passport donor value, engaging these donors beyond the delivery platform and increasing retention through improved donor experience and conversion/acquisition to the direct-debit payment method are some key takeaways from the data. 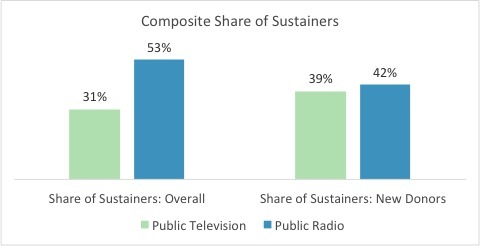 Though public radio has faced similar challenges as television in recent years, with competition from new delivery platforms and a new generation that doesn’t own radios, it has still performed well during periods of increased news consumption. With the 2016 primaries and presidential election and the ongoing intense news cycle, tuning in to public radio news stations has been strong, and FY17 results show it. 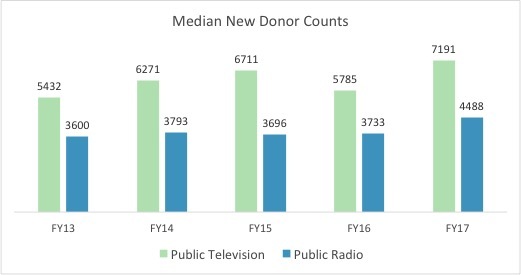 Between FY13 and FY16, median public radio donor counts fluctuated by no more than 1,000 donors. In FY17, median donor counts increased by nearly 3,500 donors for an 11 percent increase over FY16. Donors increased for 81 percent of stations in the study in FY17, with nearly half experiencing double-digit growth. With a younger audience and less use of acquisition methods other than on-air pledge, radio stations have been converting their files to sustainers at a faster rate than television. By individual station, sustainers as a share of total donors ranged from 27 percent to a peak of 82 percent, the highest of any public radio station for the second year in a row. The median share of sustainers as a share of all new donors increased for the first time since FY14, up by one percentage point to 42 percent, and ranged from 19 percent to 73 percent. For stations with the largest concentrations of donors aged 65+, the range high point was 35 percent. As with television, the sources with the most growth as a share of all new donors in FY17 for radio were digital and on-demand services. In FY17, donors acquired online outside of pledge jumped to 15 percent after being at 10 percent each year since FY14. Radio’s on-demand service is podcasting, through which just three stations acquired and coded new donors. These stations’ podcast donors were responsible for 9 percent of all new donors in the FY17 data set. On-demand and digital combined grew from 20 percent of all new donors in FY16 to 24 percent in FY17. Unlike in television, and despite the increase in donors giving via on-demand sources, radio’s overall new-donor value has not declined. Single-gift donors were acquired at a median $89 average gift, up by $2 from FY16, and the new sustaining donor average gift has not changed in five years at $11. Despite the minimal increase in new-donor value, revenue increased every year in the reporting period. Median revenue increased by 11 percent in FY17, and, since FY13, median revenue has increased by 34 percent. Overall revenue per donor has increased by $17 per donor since FY13 — from $145 to $162. Driving the increase in donor value is the growth of sustainers and major giving. In FY17, revenue from major-gift sourced donations accounted for 18 percent of all revenue from single-gift donors, up from 12 percent in FY13. In FY17, 1.5 percent of all donors gave $1,000 or more cumulatively over the course of the year. Sustaining donors have also been increasing overall donor value. The long-term value of these donors surpasses that of single-gift donors by 26 percent at 24 months after acquisition. At 49 months, sustainers out-value single-gift donors by 51 percent. Retention is the driving factor behind the greater long-term value of sustainers. In FY17, new single-gift donors were retained at a median 37 percent versus 74 percent for new sustainers retained in the 13th month. With the growth of sustainers as a share of all new donors, first-year retention rates have increased from 48 percent in FY13 to 58 percent in FY17. Multiyear donor median retention was 71 percent in FY17, but even more astounding was a rate of 91 percent for median revenue retention. The challenge for public radio will be battling donor and news fatigue and establishing upgrading strategies for sustainers. It will also need to retain new, and especially younger, donors, who may behave like emergency donors to relief organizations. Such donors tend to give in large volumes in response to a crisis and then retain at low levels when the crisis has passed. For both radio and television, the future for audience-building and fundraising remains on-demand services. This is not new information, but the investment in the invention has at last caught up to the necessity. It’s an exciting time to be in public broadcasting fundraising as we build our understanding of these new audiences and hone our ability to harness their giving power. Deb Ashmore joined Target Analytics as senior fundraising analyst in 2014 after 19 years in the nonprofit industry. Prior to Target Analytics, she was the director of individual giving at WXPN-FM in Philadelphia and VP of communications for McPherson Associates, managing the Public TV Online Fundraising Co-op and serving a variety of clients across many nonprofit sectors. She has launched and managed a successful recurring-donor program and has assisted a broad range of clients with fundraising via new technologies.